This seaside location takes you back to the Atlantic City Boardwalk, combining the charm of a 1940's coastal resort town with the best in entertainment, shopping and dining. 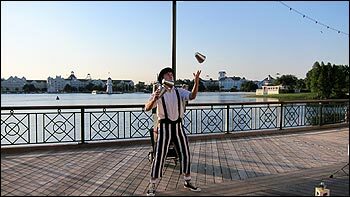 The Boardwalk Entertainment Complex is attached to Disney's BoardWalk Inn & Villas Resort. The promenade along Crescent Lake offers breathtaking views and lots of family fun. Surrey bikes can be rented here, providing one of the most enjoyable activites for the whole family. Try not to laugh as your group struggles to pedal up those hills! After dark, the twinkling lights and street performers make the area come alive. Marvel at their tricks and be ready to be part of the show yourself! A variety of midway games is available if you wish to try your luck. Stroll the boardwalk and browse the whimsically decorated shops that line the row. There's a bakery, sweet shop, clothing store, and a fine art gallery. There's even an old fashioned general store! Dining ranges from tasty Italian dishes, to some of the best seafood on property, to handcrafted ales. 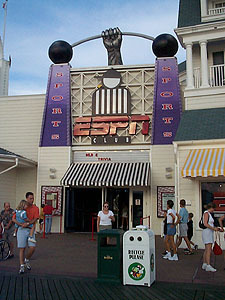 For sports fans, ESPN Club is the place to go to get your sports fix while enjoying standard sports bar fare. 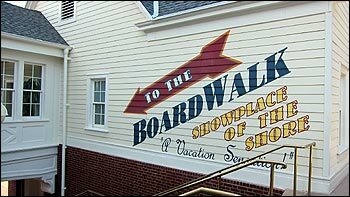 The BoardWalk is within walking distance of Epcot's International Gateway entrance, so it makes a great place to visit either before or after your time at Epcot. 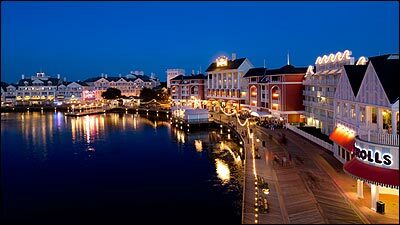 In addition, there is a scenic walking path that connects this area to Disney's Hollywood Studios park, as well as boat transportation from both parks. 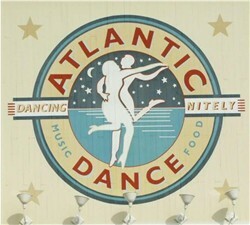 A cover charge is required for Jellyrolls and Atlantic Dance, as well as certain other special events. 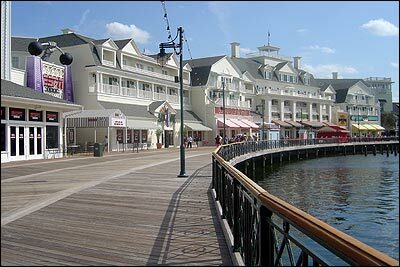 The BoardWalk is within walking distance of Epcot, Yacht and Beach Club, Swan and Dolphin, and Disney's Hollywood Studios. Lounge and dance club for the 21 and over crowd. The Art Deco ballroom hosts nightly dance parties with music from the 80's, 90's, and today. Valid photo ID required. Cover charge applies. Please Note: The Atlantic Dance Hall may be booked for wedding receptions and other special events and does accommodate live bands for those events when requested. A Dueling piano bar where you choose the play list. Take part in non-stop live entertainment in a casual atmosphere. Sing along with the crowd at this raucous venue that is a ton of fun! This is one of Orlando's hottest night clubs, so be sure to arrive early if you want to get a table. Cover charge of $12 per adult applies AFTER 9:00 P.M. 21 and over only. Valid photo ID required. "Step right up" and try your luck at some of the most challenging games of skill. Knock down bottles, race a car, shoot some hoops, or toss the ring and win prizes. Choose a 4 or 6 person surrey bike and pedal around scenic Crescent Lake. Rentals are available for either 30 or 60 minutes. Bicycles have two very small seats in front for young children (5 and under). Cyclists must be 54" tall to reach the pedals. Prices vary, inquire at the stand for the most current prices. This activity is a ton of fun for the whole family! A Sports Club with nearly 100 televisions, airing a wide variety of sports programming. This location includes a restaurant, bar, and broadcast room. Kids are welcome here, and kids meals are available. Disney's only working brew pub, where brew masters create handcrafted specialty beers. Watch through the windows as the brewmaster creates 6 tasty specialty beers, including Red Rocket Ale and Sweet Magnolia American Brown Ale. A tasty menu offers burgers, sandwiches, salads, ribs, and more. Kids meals are available. Specialties: Appetizers, salads, sandwiches, and brewery favorites. This upbeat eatery puts its busy kitchen center stage with a trendy Coney Island atmosphere. The menu is inspired by whatever seafood selections came into market that morning. 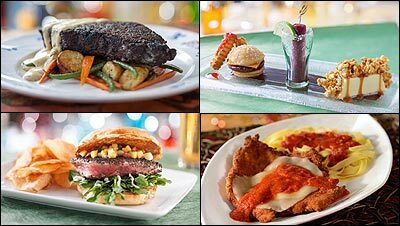 This is among the best Disney Signature dining experiences. Specialties: Seafood, Steaks and fresh seasonal items. 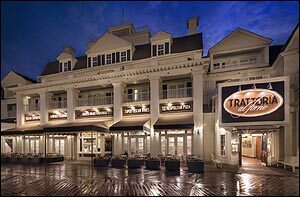 The newest restaurant at the BoardWalk, Trattoria Al Forno replaced Kouzzina in 2014. This Italian restaurants serves up specialties from all regions of "the Boot", from Northern Italy to Sicilian and Neapolitan favorites. The menu boasts regional speciaties as well as classic favorites. Pastas and pizzas are prepared "al forno," Italian for "baked in an oven." The wine list here is 100% Italian, making it unique among Disney eateries. Specialty coffee and desserts are also available. Recently expanded, this new bakery is more than twice the size of the original. A vast glass case shows off a tantalizing array of baked goods, cakes, tarts, cookies, sandwiches, soups and salads. Fresh fruit, yogurt, and other grab and go items are also available. This is a great spot to grab a quick meal to enjoy on the Boardwalk. Limited outdoor seating is available. Attached to Trattoria Al Forno, this window serves up pizza by the slice. Choose from cheese, pepperoni, or "Boardwalk Specialty" slices. Draft beer, sangria, and soft drinks are also available. This cart on the boardwalk serves up tasty American favorites such as hot dogs, corn dogs, pulled pork sandwiches, chicken tenders, and fries. Alcoholic beverages, including margaritas, pina coladas, and the specialty drink: The Captain's Seaside Sensation-a pineapple smoothie with a shot of Captain Morgan spiced rum. Mickey Pretzels and roasted nuts are also available. Fresh and hot funnel cakes topped with powdered sugar, chocolate syrup, or ice cream (or all three!) can be found here. Located outside of New York City for the very first time, Ample Hills Creamery gives you and your family the chance to see magic being made as ice cream and mix-ins are handcrafted the old-fashioned way. Hours Vary. Check shop for hours daily. Disney character merchandise for all ages. The world famous muralist brings his marine animal artwork into your home. 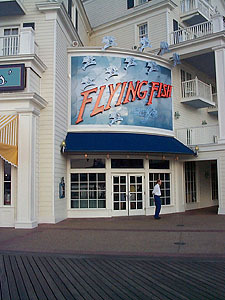 This fine art gallery features a large variety of licensed Disney artist masterpieces as well. Character apparel and accessories for men and women. Reminiscent of a Mid Atlantic general store. This store has it all! A decent selection of groceries can be found here, along with packaged Disney food items and candies. *All times and policies are subject to change.